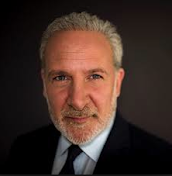 Peter Schiff On The Markets: Capital One (ONE): Signs Of A Weaker Economy? The Dow Jones Industrials just had its worst week since January. We closed the week at 17,568, down 518 points on the week. Friday`s drop alone accounted for 163 points. An interesting corporate earnings news item that came out on Friday was Capital One (COF). They are one of the nation`s largest issuers of credit cards. And if the U.S. Economy was really doing as well as everybody pretends it is you would expect credit cards companies to be doing well because people have jobs, the economy is growing so the users are not falling behind on their credit cards. In fact they would be using more their credit cards to buy more things because they feel better about the economy, they are willing to spend more. So everything should be going well at Capital One (COF). Instead they came out with a huge earnings miss, the shares plunged by 12 percent!